On this first day we will be meeting with your guide in Jenin, a small debriefing about the program. Pass through the agriculture-based villages of the Jenin Governorate and enjoy the lively olive harvest season. The olive groves are perfect spots to rest with a cup of herbal tea brewed on a fire. Aside from a beautiful natural landscape that includes the gnarled, enchanting trunks of ancient olive trees, there are plenty of landmarks to encounter, such as Burqin Church. The trail passes through agricultural fields filled with cabbage and tobacco, as well as through beautifully preserved old villages like Arraba and Sanur, where you will be greeted with traditional Palestinian hospitality. On the fifth day of the journey, you will reach Nablus, a city sure to enthrall you with its history, culture and hospitality. Nablus is located between two mountains - Gerizim and Ebal - and reflects the mysteries that come with a thousand-year existence. After exploring the bustling markets of Nablus’ Old City you will again be greeted with the tranquility of the surrounding villages. Follow the Masar Ibrahim and enjoy the marvelous views over the Jordan Valley. Rummana, a town whose name literally means 'pomegranates', is approximately 17 km northwest of Jenin in the northern West Bank. This hike is one of the most challenging but amazing hikes in Palestine. We will start by walking up a hill through the ancient village, where you will find traces of ancient remains, including cisterns and caves carved into rock. Next you will come across a village called Ta’ennek in the northwest of Jenin, where you will be welcomed and hosted by their village consulate and some local people. Ta’ennek is a tranquil and quiet village with a very simple way of living. We will continue walking towards Burqin, a small agricultural village. Walkers will have the chance to purchase locally produced fresh fruit, olive oil and other organic products. Burqin is home to the Church of St. George, also known as Burqin Church, which is said to be one of the oldest in the world. 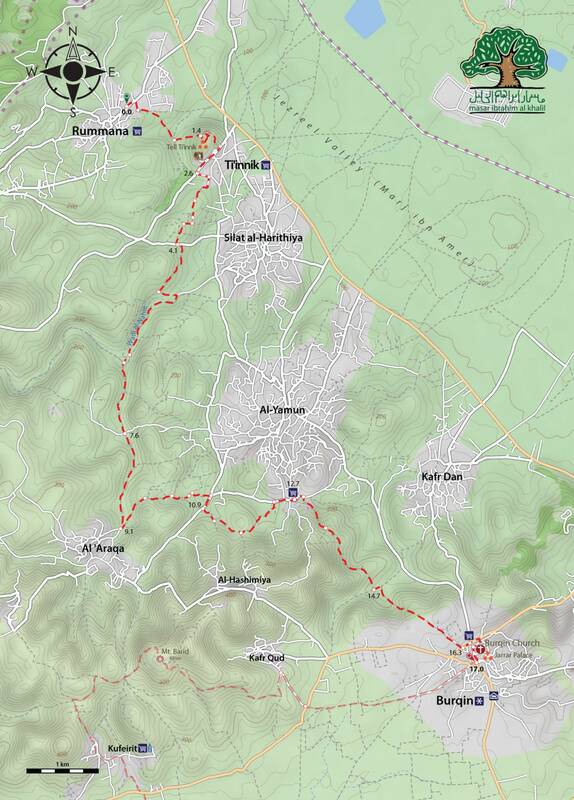 We will start our hike from Burquin, a small agricultural village in the northern West Bank. Walkers will have the chance to purchase locally produced fresh fruit, olive oil and other organic products: the area is known for its olives and olive oil, and most villagers depend on the industry to make their livelihood. We will continue walking to Arraba, where you will find beautiful antiquities from the Ottoman era and breathtaking views of the surrounding mountains, plains and valleys. In Arraba you will be welcomed with a tour of the old city and again be hosted by the village consulate. 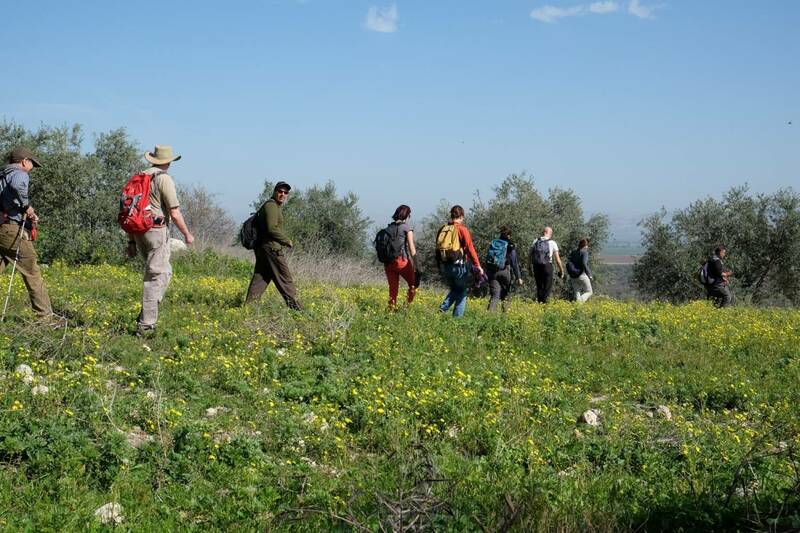 We will start our hike from an ancient palace in Arraba's historic center and continue through olive groves and orchards to arrive at Sanur’s hillside lookout tower, approximately 26 km south of Jenin. In Sanur you will meet with the village consulate and enjoy a tour of the old city, before relaxing and enjoying a lively evening filled with traditional food and culture. The walk begins in Sanur: from there, you will travel south by donkey to Sebastia, approximately 12 km northwest of Nablus. You will visit the ancient hilltop city of Sebastia, home to several important archaeological sites dating back to the Canaanite, Israelite, Hellenistic, Herodian, Roman and Byzantine periods. 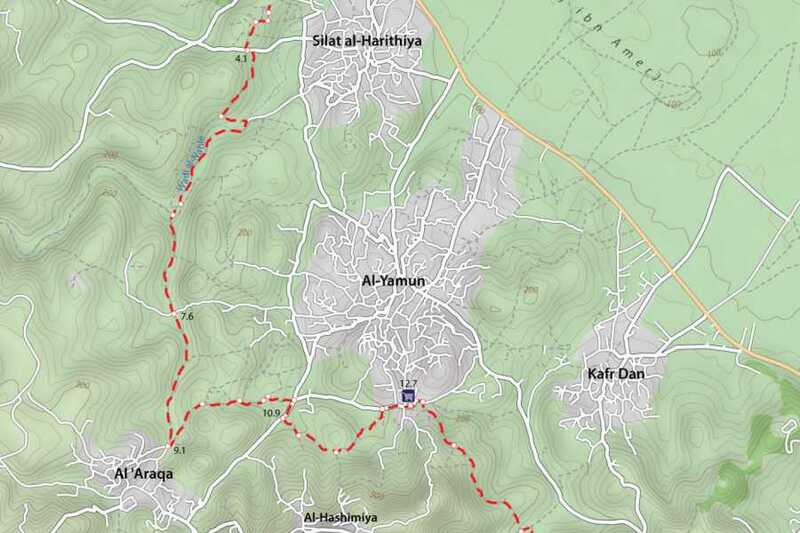 The walk begins in Sebastia, approximately 12 km northwest of Nablus. The old city of Nablus is home to a number of sites of archaeological importance, including Jacob's Well. Nablus is famous for its delicious dessert, kanafeh, as well as its olive oil soap. Enjoy your walk! After breakfast you will be transferred from Nablus to Awarta, where you will walk through the beautiful hills of the Nablus region towards Duma. Awarta, 8 km southeast of Nablus and 560 m above sea level, has been inhabited since biblical times. The villages in the Nablus Governorate are interspersed in a mixed landscape of plains and mountains. The area is famous for its bountiful crops of olives, almonds, corn, lentils, and a variety of summer vegetables such as tomatoes and zucchini. The production of olives and olive products is one of the main sources of income for many inhabitants. The walk begins from Duma and passes through the village of Mughayyar and alongside the deep, rocky wadi to the natural springs and archaeological site of Ain Samia. You will be transferred to Taybeh, a mainly Christian village, where you will visit the oldest microbrewery in the Middle East, Taybeh Brewing Company, as well as the ruins of the 4th century church of St. George.